In any modern kitchen you are likely to find a wide variety of small cooking appliances and cooking tools filling the cupboards and drawers and strewn across the countertops. These contraptions can do any number of things, but we often find ourselves back to using the basics. No matter how far technology brings us, the number one most useful cooking tool in any kitchen will be the pots, pans and skillets we use to prepare the food we eat. Technological advances have even changed these though. There are any number of types like cast iron, enamel and nonstick skillets available for purchase today. They all have their downsides, however. Cast iron skillets are heavy and can be difficult to clean and store, with enamel and non-stick skillets you must be extremely careful, so you don’t scratch the coating. 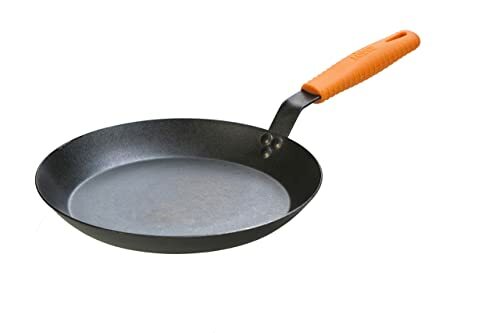 The coating on non-stick skillets is easy to flake off and get in your food, not to mention there is much debate about the chemicals that might be leached into your food from this coating. What else is there to use, though? Glad you asked! Today we will be taking a look at carbon steel skillets. We’ll go over their benefits and drawbacks, and then we’ll give you some information on our top picks. I. What Is a Carbon Steel Skillet? Carbon steel is a group of iron-carbon alloys with a carbon content less than 2%, a carbon steel skillet is a fantastic type of cookware. Though they have many similarities with cast iron cookware, carbon steel skillets do have several advantages when they are compared to the time-tested cast iron skillets. Both carbon steel and cast iron skillets can be used for multiple things. They can be heated to high temperatures and are able to be used in the oven, there is no worry of leaching chemicals during cooking, and both are incredibly durable. Carbon steel skillets are much thinner and lighter, and they also have a much smoother surface that makes them easier to season. These skillets heat quite fast and they do not lose much heat when you begin to add the meats, vegetables and other ingredients you are cooking. They also cool much faster than traditional skillets. You can use whatever cooking utensils you wish with carbon steel skillets, and you don’t have to be concerned about accidentally scratching the skillet’s coating from its surface. If you have an induction cooktop, you will be pleased to know that carbon steel skillets will work just fine on it, alleviating the need for cookware that is made specifically for your situation. With proper seasoning and care, your carbon steel skillets can last a lifetime. Lodge dominates the cookware space with top-tier kitchen necessities that don’t bankrupt you. This pre-seasoned skillet works well with pretty much any heat source. Get your food cooked quickly and evenly with this outstanding skillet at a price you’ll love. Now you know more about what carbon steel skillets are and why they are a great choice for you to use in your kitchen, let’s look at 5 of the very best skillets on the market. Lodge has long been known for their fantastic cookware, and this carbon steel skillet is no exception. Manufactured with high density 12 gauge carbon steel, the Lodge CRS10 measures 18.8” x 10” x 1.4” and weighs just 3.1 pounds. 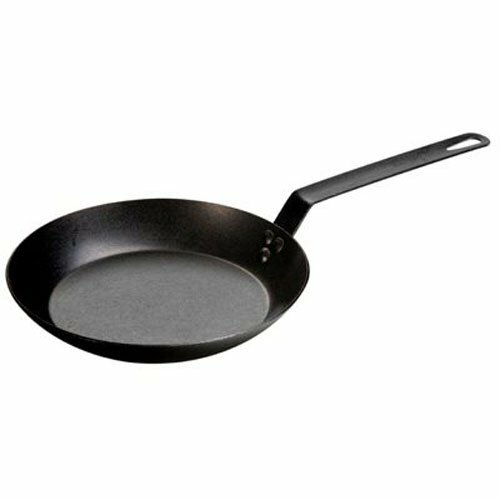 This carbon steel skillet can be used on either high heat or low heat. When used at high temperatures, it will beautifully sear your food. The carbon steel heats quickly and evenly and stays well heated, ensuring that your food is cooked properly and in less time. You can use this skillet on nearly any type of cooking surface including gas, induction stovetops, electric ranges, outdoor grills and even on an open fire. The only place you cannot use this skillet is in the microwave oven. The handle attached to the skillet is angled in a way to make using the skillet easier for you. You can easily use the skillet on your cooktop or place it in your oven to cook foods as well. This skillet has been pre-seasoned at the factory with natural soybean oil, saving you a step and allowing you to get right into cooking with it. The longer you use your pan, the better the seasoned finish becomes, making your pan more non-stick the longer it is in use. De Buyer pans are made in France and they are highly sought after. They are an incredibly popular choice among chefs in professional kitchens. The De Buyer Mineral B measures 4.2” x 12.6” X 1.7” and weighs 6.5 pounds. Having a little over 12 inches of cooking space in this skillet should be enough for nearly anyone’s needs. The manufacturer claims that their pan is the most “ecofriendly cookware on earth”, of course, that is subjective. However, this specific skillet is made from 100 percent natural 99 percent pure Iron. As with all carbon steel skillets, this one is great for use on high heat though it functions just as well when used on low heat. When used on high heat, your food will be well seared and evenly cooked. Great for using on stovetops of all kinds including electric, gas and induction, the De Buyer Mineral B Round Carbon Steel Fry Pan can also be used on an open fire or in the oven. The handle of this skillet is curved a la Française, allowing it to easily be maneuvered on the stovetop or to placed in and removed from the oven. 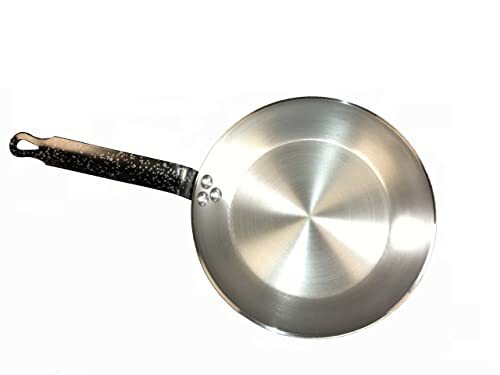 While this particular carbon skillet does not come pre-seasoned from the manufacturer, it has been treated with a bee wax finish in order to help fight oxidation during the seasoning process. Don’t worry if you don’t know how to do that, we will get to it in just a bit. Paderno pans are available in an impressive array of sizes. Our favorite is this nifty little frying pan. Measuring at 19” x 9.5” x 1.5” and weighing only 2.65 pounds, this frying pan is lightweight and a bit smaller than some of our other picks, but it will easily get the job done. This frying pan is 3mm thick which allows for the pan to be preheated for a longer period of time and helps is to retain heat well once it has been heated. With excellent conduction of heat, this frying pan will help to cook your food evenly and thoroughly without concern. When used at high heats, this skillet is perfect for searing meats and other foods to lock in the flavor while adding to the visual appeal of the food. The handle of the pan is attached to the cooking part by three rivets. The handle is flat, and while not the most ergonomically friendly design, it does serve its purpose well. Having a handle helps to make removing the skillet from the oven an easier task. This skillet can be used to cook food in the oven as well as on nearly any type of cooktop including electric, gas and induction styles. This skillet does not come pre-seasoned, so this is something you will need to take care of yourself before you use it to cook in the first time. In a section below, we will go over how to do this so that you can do it correctly and get as much life as possible out of your carbon steel skillet. Don’t be surprised to see another choice from Lodge on our list. There is a reason they have been in business since the 1800s. This carbon skillet is bigger than the one above. It comes in at 4.45 pounds and measures 21.1” x 12” x 3.9”, giving you a usable cooking surface of 12 inches. The skillet is made from heavy-duty 12 gauge carbon steel, and the handle is attached to the frying pan with strong rivets. Perfect for searing, sautéing, grilling, roasting or frying, this carbon steel skillet from Lodge can do it all. The skillet heats quickly and evenly, helping to cook your food properly. Electric ranges, gas ranges and induction cooktops are all usable for this carbon steel skillet, as is the oven. Because the skillet and handle heat up so much during use, it can be easy to hurt yourself. Not with this specific skillet though, as Lodge provides a silicone hot handle holder with the skillet. The holder will protect your hands from heat up to 500°F. Lodge pre-seasons their cookware at the factory, ensuring you receive it ready to use with an already baked in easy release finish. Unlike many of its counterparts, this skillet is dishwasher safe which adds to its ease of use. Rounding out our list of favorites is this round-bottomed wok from Craft Wok. This wok has been made in the traditional way, having been hammered into shape by hand by Chinese professionals in Guangzhou, China. This wok is favored by many professional Chinese chefs and has been a staple in the homes of many people who like to cook Chinese food in the traditional way. 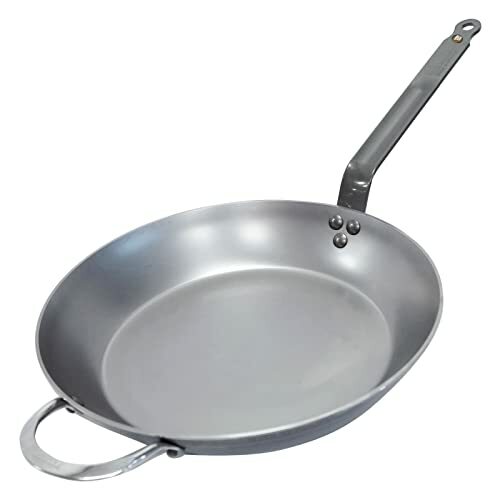 Forged from 15 gauge commercial grade carbon steel, this wok measures 22.5” x 14” x 6” and weighs less than five pounds. It provides a deep cooking area that is great for making stir-fry and other traditional Asian cuisine. The wok can be heated to high temperatures quickly, and it will retain the heat from those temperatures allowing you to quickly and evenly cook your food. 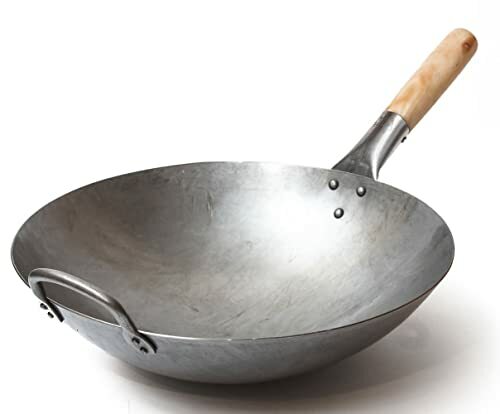 In addition to being used as a skillet, this wok can be utilized as a vessel for deep frying foods in hot oil, and you can also use it for making small batches of soup. With other supplies you can even put this wok to use as a steamer or a smoker. The handle is attached to the pan with steel rivets, and the end of the handle is wooden. This is incredibly useful so you don’t burn your hand when cooking food at high heats in your wok. The wok does not come pre-seasoned, but we will shortly be explaining to you how to accomplish this step, so no need to worry! All carbon steel skillets must be seasoned. Some will come from the factory having already been seasoned by the manufacturer, but most will not have gone through this process. Even if the skillet was pre-seasoned before you purchased it, you will need to season it again as time goes on, so it is a good idea to know how to complete this task. The process of seasoning works to bond external oils to the surface of the skillet. This helps to provide protection against rust and oxidation. Seasoning is important so that it protects the carbon steel, but seasoning is also what helps your skillet to become non-stick and simpler to use. Carbon steel skillets can usually be seasoned on the stovetop or inside the oven, and neither method is better than the other. Once your oven is heated, place your carbon steel pan in the oven for 10 to 15 minutes so that it gets hot. Carefully remove the skillet from your oven. Remember that it will now be at least 400°, so protect your hands from the heat. Using a paper towel, liberally apply your oil to your carbon steel skillet on both the inside and outside surfaces. Vegetable oil works well, though olive oil and coconut oil will work best. Once your carbon steel skillet has been thoroughly oiled, place it back into the hot oven (400°F). Allow the skillet to remain in the heated oven until the oil turns black on your skillet. This can take up to an hour. Once the oil has blackened the surfaces of your carbon steel skillet, turn off the heat. Do not remove the skillet from your oven, instead allow it to completely cool inside the oven. This can take a long while, so it might be best to leave it overnight. Once your skillet has cooled completely, you can remove it from the oven and it is ready to be used. Place your carbon steel skillet on the stovetop burner and turn the heat to medium-high. Allow the skillet to heat until it is hot. There will likely be smoke that wisps up from the skillet as it heats, and the pan will turn brown. Once the skillet is hot, remove it from the stovetop. Again, this skillet will be extremely hot so remember to use something like oven mitts to protect your hands from the heat. Holding your skillet with one hand, use the other to liberally apply oil to the inside and outside surfaces of it. This is easily done using a paper towel or soft cloth. The best oils to use are ones that have a high smoke point. Place your skillet back on your stovetop burner and turn the heat up to high. Heat your skillet until the oil or fat begins to liquefy and turn black on the surface of your skillet. Using something to protect your hands from the heat, remove the skillet from the stovetop and wipe away any leftover oil that remains in or on the pan. Place your pan somewhere out of the way and let it cool completely. Once cooled, your carbon steel skillet is ready to be used! When you are seasoning your carbon steel skillet, there are a few things you should be mindful of. You are working with high heat and fat, so there will be smoke. It can often get quite smoky while you are seasoning your skillets. Be sure you’ve opened windows and turned on vents to allow this smoke to escape. Don’t freak out when your skillet begins to turn brown or black. You haven’t ruined it, we promise. This discoloration of the metal is actually what you want to happen during the seasoning process. Once the metal has become blackened, you will know that your skillet has been properly seasoned. Over time, the seasoning you did will begin to wear off. You will notice that the foods you cook are beginning to stick to the skillet a bit, or maybe tiny bits of black stuff are flaking into your food, or you might even notice a few small spots of rust appearing. If these things happen, you don’t need to rush out and buy new cookware. When the seasoning on your skillet begins to wear off, you simply need to season it again. You now know that the process isn’t that complicated, and once you’ve done it a few times it will be even easier. You might not think the type of skillet you use to cook your food makes much difference in the outcome of the food, but it really does. Most home cooks flock toward the non-stick options that are available, the coated skillets or the cast iron skillets. These aren’t bad choices, but we do think that carbon steel skillets are the best choice. The benefits they provide certainly justify having at least one if these skillets in your cookware collection. Carbon steel skillets are lightweight, smooth, safe to use in the oven, excellent for searing foods, quick to heat and good at retaining their heat, great to use for tossing foods while cooking, simple to clean and maintain, and able to be used on induction cooktops. It might seem like a bit of a pain to continually go through the process of seasoning your carbon steel skillets, but if you do it correctly and maintain them well, these skillets could be passed down through your family for a generation or more. Do your research and find the carbon steel skillet that will suit your needs, make sure you carefully maintain it and you will get plenty of years of faithful service from your cookware.